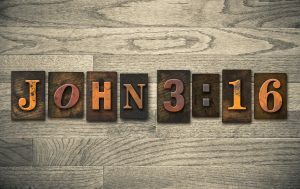 In one of, if not the most popular passages of Scripture, we are told “God so loved the world, that he gave his only Son, that whoever believes in him should not perish but have eternal life” (John 3:16). What specifically do we learn about God’s love from John 3:16? First, we learn WHO God loves. John 3:16 says, “God so loved THE WORLD.” It is worth noting that John 3:16 does not say that God so loved Christians, God so loved the church, or God so loved those who obey Him. Instead, John 3:16 says “God so loved THE WORLD.” That is a bold assertion when you consider what the world is associated with throughout Scripture. According to Romans 5:12, the world is associated with sin since “sin came into the world through one man.” According to 1 John 2:16-17, the world is associated with temptation since “the desires of the flesh and the desires of the eyes and pride of life” are “from the world.” According to Matthew 13:22 and 1 Corinthians 7:33-34, “the world” is associated with “cares,” “concerns,” or “anxieties” that distract from one’s focus on God. Finally, according to 1 Corinthians 3:19, “the wisdom of this world” is identified as “folly.” Thus, throughout Scripture “the world” is associated with everything that is unrighteous, unholy, or ungodly, and the reason “the world” is associated with such things is because it is under the influence of the devil. The Bible identifies the devil as “the god of this world” in 2 Corinthians 4:4, “the prince of the power of the air” in Ephesians 2:2, “the evil one” under whose power “the whole world lies” in 1 John 5:19, and “the deceiver of the whole world” in Revelation 12:9. Yet, the devil’s influence over the world does not infringe upon God’s affection for the world. God’s love was and is extended to everyone who falls under His jurisdiction. That includes those who disobey Him, those who mock Him, those who oppose Him, those who reject Him, and those who hate Him. The New Testament communicates God’s love of and redemptive actions for the benefit of not just those who do right but everyone on earth. Just look at the statements in Scripture that identify the mission of Jesus. John the Baptist called Him “the Lamb of God, who takes away the sin of THE WORLD” (John 1:29). Jesus said, “I did not come to judge the world but to save THE WORLD” (John 12:47). In 1 Timothy 1:15, Paul said, “Christ Jesus came into THE WORLD to save sinners” and in 2 Corinthians 5:19, he said, “in Christ God was reconciling THE WORLD to himself.” John said that Jesus “is the propitiation for our sins, and not for ours only but also for the sins of THE WHOLE WORLD” (1 John 2:2) and that “the Father has sent his Son to be the Savior of THE WORLD.” (1 John 4:14). If the world includes people that hate God, people who reject God, people who oppose God, people who deliberately disobey God, and people who do not love God in return then why does God love the world? God loves the world because “God is love” (1 John 4:8, 16). God’s love is not based on some external source. God does not love the world because of what it has done for Him or because it has loved Him in return. God’s love for the world was not earned or bought. God’s love for the world is the result of God’s nature. God loves the world because He’s God. Second, we learn HOW God loves. John 3:16 says, “God SO loved the world.” The word “so” is interesting because it indicates that there is a specific manner in which God loves the world. In other words, this statement is not just saying that God loves the world but that God loves the world in a particular way. So, it has to be asked—in what way does God love the world? God loves the world eternally. In other words, His love has no end. As Jeremiah said in Lamentations 3:22, “The steadfast love of the Lord never ceases; his mercies never come to an end.” That means God does not fall out of love with people. His love is constant and unchanging. There never was a time when God did not love you nor will there ever be a time when God does not love you! God loves the world unconditionally. In other words, God’s love is not based on our performance. God loves us in spite of our performance. Such is indicated by Paul in Romans 8:38-39, which says, “For I am sure that neither death nor life, nor angels nor rulers, nor things present nor things to come, nor powers, nor height nor depth, nor anything else in all creation, will be able to separate us from the love of God in Christ Jesus our Lord.” God’s love is not conditioned upon your faithfulness or obedience. Our salvation is conditioned on such things, but God’s love for us is not. God loves the world unintrusively. In other words, God does not force us to love Him in return. He grants us the freedom to choose whether or not we are going to reciprocate His love. This aspect of His love is demonstrated in the Parable of the Prodigal Son when the Father, who appears to represent God, allowed his youngest son to make selfish choices without His interference (Luke 15:12). In the same way, God allows us to choose whether or not we will have a relationship with Him. That is why, in Joshua 24:15, the Israelites were told to “choose…whom you will serve,” and, in Revelation 3:20, Jesus is depicted as someone who “stand[s] at the door and knock[s],” awaiting an invitation to come inside. God loves us sacrificially. God loved us enough to sacrifice His only Son. In fact, this sacrificial love is the specific message of John 3:16, and it is reiterated in Romans 8:32 where Paul said that God “did not spare his own Son but gave him up for us all.” God so loved the world that He unhesitatingly sacrificed His Son for the benefit of the whole world, even those who would not appreciate His sacrifice. John 3:16 is a well known verse for good reason because it communicates WHO God loves and HOW God loves. However, John 3:16 is also a challenging verse because it should cause us to consider what we should do in response to the love that He has shown to us.